Have you been wondering if you're ready to invest? Here are indicators that you;re financially, intellectually, and emotionally ready to get going in the stock market. You have savings for large, unexpected expenses. Before you get started in investing, you may want to have some money set aside in a regular bank account for unexpected expenses. For example, you might need to have a costly dental procedure or replace gutters on your roof. Regular savings can possibly pay these bills so you won't have to sell investments to cover these expenses. You have extra cash each month. If you consistently have money left over from your paycheck or business earnings each month — after paying monthly bills, setting aside dollars for non-recurring expenses (like property taxes and car insurance), building up your emergency fund, and making loan payments — then you may be ready to start investing. You can tell if you really have extra cash, not allocated for other items, if money is piling up in your checking or savings account. Note that you don't have to have $1,000 a month or even $100 to start investing. Sure, the more cash you have, the more choices you have but you don't need huge piles of cash to start investing. You want to grow your wealth. You have a genuine desire to grow your wealth, not to be greedy but to be a responsible steward of your money. You may even want to invest in a certain company or sector that is meaningful to you and you believe is important to the world; for example, you may want to invest in solar energy to promote renewable energy sources or put money in a technology that can aid development in third-world countries. You may earn an average salary and realize that investing can help you reach life goals in a way that simply saving your paycheck every month can not. You realize that one day you'll want to live off your investments, not your earnings. To be committed to investing, you may want to imagine living on income generated from your investments. Streams of income from your investments (mostly likely generated by selling shares of stocks, mutual funds, or ETFs and/or collecting dividend payments) could replace or supplement a salary, business earnings, and social security benefits. You may see stocks, bonds, and other investments as mechanisms for possibly protecting your future, not detracting from your present. You welcome excitement in your life. You don't have to be the type of person who goes BASE jumping, rock climbing, skydiving, or bungee jumping every weekend to be ready for investing. But you may want to be willing to embrace adventures, like a hike on an unfamiliar trail or kayak on a different stretch of river occasionally. Investing is not necessarily for the person who wants to control every aspect of his or her life with absolute certainty. It's more for the person who realizes that risk and uncertainty can make life more interesting and rewarding. You're willing to learn through your experiences. You realize that you don't know everything but you are willing to act on what you do know and learn as you go. Investing provides a wealth of educational experiences whether you are learning what types of financial advisers to trust; how to choose a mutual fund; how to value a growth stock; what types of managed portfolios are available; how and why to resist selling in a down market; and more. It's annoying and frustrating that you have to learn by investing real money, hard-earned cash. But lessons learned from real-life experiences, not textbook ones, are more likely to stick with you. The important thing is to be able to extract meaning from those lessons, good and bad, so that you can gain insights and continually improve as an investor. You have the time and inclination to read about investing. You may be ready to invest your money when you have some time and a general willingness to invest time in learning, not several hours a day but at least a couple of hours each month. Your self-education may help you avoid making major mistakes plus allow you to learn specific lessons from your investment experiences. For example, you may learn why certain financial advisers promote their firm's proprietary mutual funds over mutual funds, or come to a better understanding of why index funds tend to rise when the market is up. I'll admit that sometimes I have zero interest in reading about Roth IRAs or a new portfolio management product. Fortunately, there are times when I am fascinated about a new publicly held company with a game-changing technology or have a light-bulb moment about a tax strategy involving my investments (like when I figured out we could build up Roth assets in my husband's 401(k) plan). There's never a perfect time — in terms of market conditions — to start investing. But you can assess your readiness with these signs. What do you think? 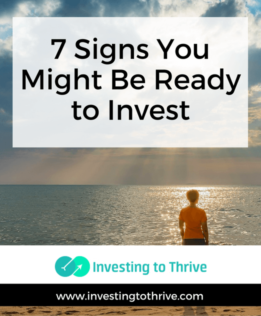 Do these signs indicate you are ready to invest?